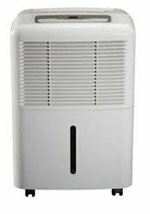 The Sunpentown 30 Pint Dehumidifier (SD-30E) is recommended by Sunpentown for smaller areas of up to 200 sq ft. The unit is externally identical to the 40 pint SD-40E and is ideal for those with a small room for whom the 30 pint capacity is adequate and who wish to have a slightly quieter machine that uses less power to operate. It comes with Energy Star certification and due to its efficient refrigeration coils, fan and compressor uses between 10 and 20% less energy than many other brands with a similar capacity. The Sunpentown 30 Pint Dehumidifier is a compact machine with a small foot-print. It is only 13.4 inches wide by 10 inches in depth so will occupy slightly less than one square foot of floor space. This is particularly important in a smaller room where the area available may be a little restricted. The unit is also portable. Caster wheels attached to the base make sliding it across a floor easy and a convenient, retractable carry handle is fitted for movement over and around obstacles or by stairways. The fan, refrigerant, compressor and other parts invariably make these devices quite heavy but at 33lb this is a relatively light unit that should not be difficult for a typical person to lift and carry. The Sunpentown 30 Pint Dehumidifier incorporates an adjustable humidistat, vital to control both relative humidity and energy consumption. The humidistat can be set to any level of relative humidity you choose in a range rising from 35% to 80%. Once your chosen level has been reached the unit will stop operating until it senses that humidity has risen again above that level. It simply cycles on until the pre-set level is restored and then cycles off. This procedure is repeated as often as is necessary to maintain a constant moisture level. By limiting operation of the unit to the minimum necessary this saves on energy costs. The level of relative humidity is a matter of choice for the user but some guidelines may help. A level of between 30 and 70% is comfortable for most people to live with. At 60% and below the risk of mold and other moisture damage is minimal and at 50% or less the environment is sufficiently dry to discourage dust mites, which are a major contributory cause of allergic reactions. At levels of relative humidity below 40% there is a risk of some materials drying out too much and deteriorating as a result. This applies particularly to wood and leather. To gain all the benefits with no risk of damage from excessive drying a level of 45 to 50% is ideal. As the water is drawn from the air it has to go somewhere and, like all portable models, the Sunpentown 30 Pint Dehumidifier has a water collection container into which the water, or condensate, can fall. At 11 pints this container is quite large for a unit of this size but it will need to be emptied, possibly once or twice daily. If you would prefer to avoid this chore you may take advantage of the unit's continuous drainage feature. In the casing there is an outlet to which a small plastic hose may be attached. The condensate will flow through the pipe under the force of gravity and can be discharged into a nearby drain or other outlet. Because the drainage is by means of a gravity feed this alone will not carry the water upwards, to the floor above for example. If this is what you prefer it will be necessary to purchase a condensate pump which will achieve this. You will note that the Sunpentown 30 Pint Dehumidifier will operate at temperatures down to 41°F. Efficiency is likely to be less at such low temperatures because of ice formation on the refrigeration coils. This unit is not fitted with a defrost system so it is not suitable for those who need to control moisture in a cooler area, such as a basement. All these appliances make some noise, principally from the fan which draws in moist air and expels the dried air. The SD-30E is, however, relatively quiet. This is particularly so at the lower fan speed setting at which the noise level is only 49dB. Other features of the Sunpentown 30 Pint Dehumidifier include auto-restart to reactivate the unit following a power outage, a washable air filter, easy to use electronic controls and a "turbo" mode using the higher of the unit's two fan speeds for faster drying.